Yep, that is how mine was operating but i don't like the engine revving that high when cold. I managed to set it at 1700rpm when cold. I wanted to ask those who've adjusted the cold idle what's the easiest way to gain access to it? I found that removing the tank and using 10mm & 7mm ignition wrenches (they're thinner than standard wrench) was the ticket. I loosened the 7mm nut and then turned the 10mm nut clock wise about a quarter of a turn and now cold idle is about 1600 rpm. 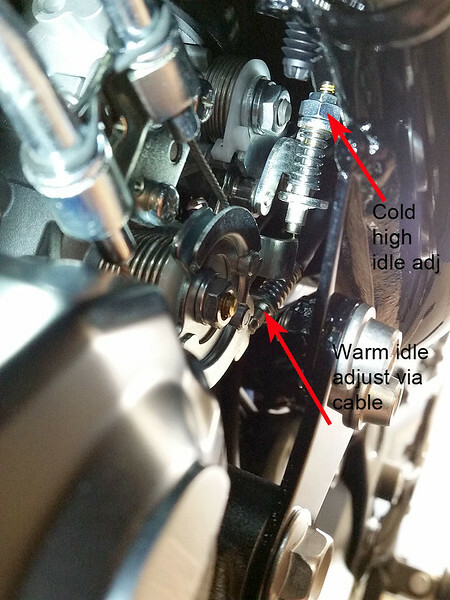 Quarter turn was suggested by a member on the Z900 forum and it worked for where I wanted cold idle to be. Hope this helps. I just brought mine home yesterday so I'm feeling my way around the bike. I'll see what it takes to get the tank off. I just took the side cover off, bit fiddly but easy enough. I'll try pulling the side cover first, then proceed to the tank if need be. This phenomenon just came to mind while I was checking the service manual for a high idle spec (there isn't one listed, btw). I wonder if this surge is from the bike pulling fuel vapors from the emissions canister. That would cause a richer mixture that could cause the increased engine RPM. Or it might be clever engine management to get old circulated before increasing the revs? I quite like this behaviour if the higher idle warms the bike and oil up quicker, before I start to ride. 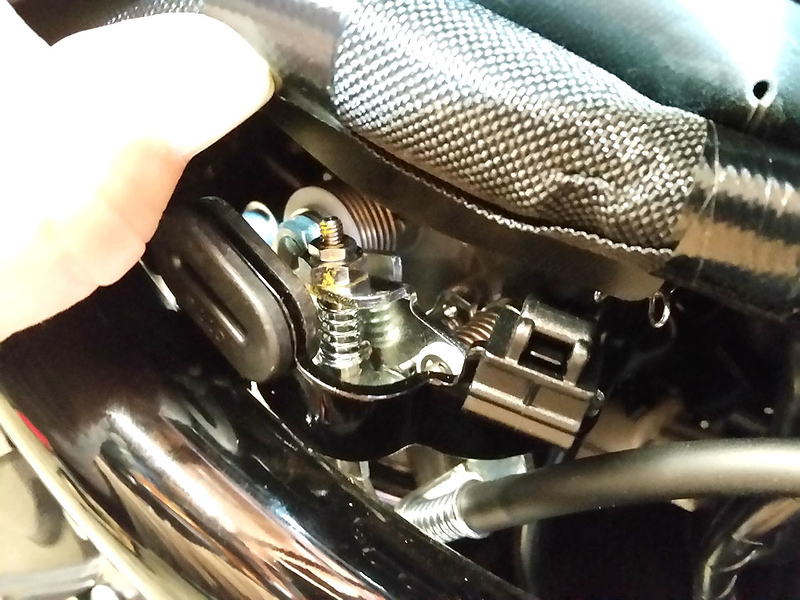 So I tried just removing the side panel, 1 bolt at the top then pull out from the rubber grommets. I cut the wire tie holding the harness, after lifting it up you have pretty good access to work. I don't see a need to remove the tank. Just for reference, after you loosen the 7mm jamb nut turn the 10mm nut clockwise to reduce idle speed. When you have it where you like it tighten the 7mm jamb nut. I adjusted it by starting then observing the rpm, then shut it off quick and readjust as needed. I have it now so when it first starts it goes to 1,500 rpm then rises a bit to ~1,600 then gradually drops back down to warm idle once about 3 bars are showing on the temp guage.